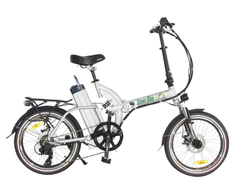 The Trailclimber is an awesome step through electric bike that comes with an all aluminum frame, lithium battery, and disc brakes. 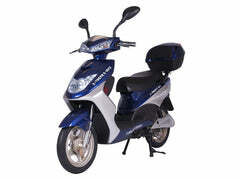 It's light-weight and sleek and has a powerful motor that makes riding a blast/ The step-through style makes getting on and off a breeze. It comes in both Black and Aluminum Silver colors. 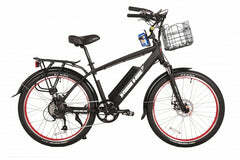 This electric bike is often purchased by commuters or those looking to use it in off-road situations. 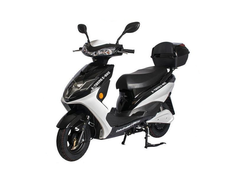 It is equipped with a front suspension to tackle rough terrain or soften bumpy city streets. 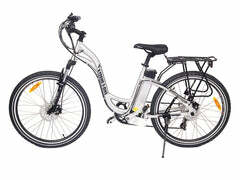 The three-hundred watt motor is powerful for such a light bike (52 lbs). 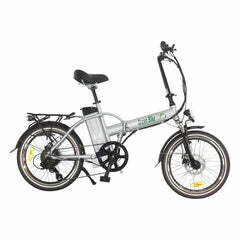 The frame is all aluminum which makes it light-weight and rust resistant. 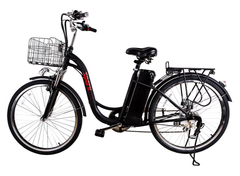 Disc brakes give this bike extra stopping power. 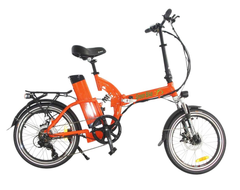 The Trailclimber electric bike only weighs 52 lbs with the battery installed making this a very lightweight full sized electric bike. 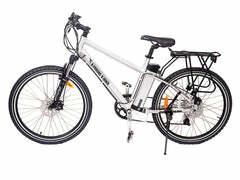 The 18 -inch frame is all aluminum and rust resistant in case it's exposed to water. This bike comes mostly assembled. 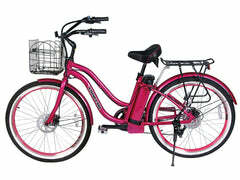 Wheel, handlebar, pedal, and rear rack attachment necessary. This bike comes with necessary tools, can be completed in 15 minutes by most people. 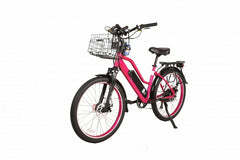 Not interested in a step through bike? 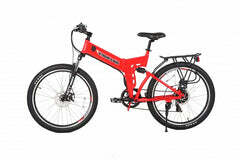 Check out the Trailmaker, same bike with a different frame.